Welcome to the second round of our 2010 Character Cup. We have whittled down our 24 starting drivers to just 12 competitors, and now they will go head to head to make it through to what should be called the semi-finals, but will have to be called round 3 as there are more than two matches. 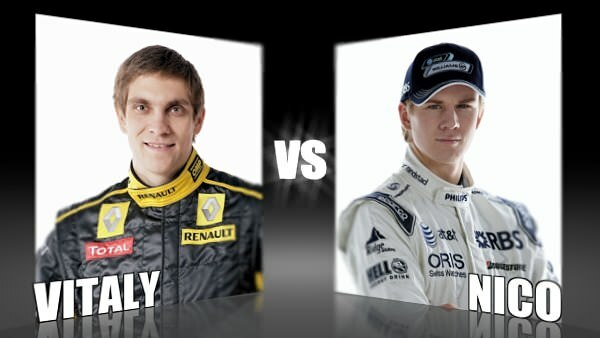 Today we begin with Renault's Vitaly Petrov and Williams' Nico Hülkenberg. Vitaly caused the first upset of the cup this year, in the very first round of the competition. The Russian knocked out defending champion Fernando Alonso in a hotly contested vote. Now he's back, and we have slightly more information to go on this time. Over the weekend, we heard Vitaly get a stern talking to on his team radio - was he not following orders or simply getting things wrong? Does this affect how you vote for him? Nico's victory over first round opponent Sébastien Buemi was another close fight with The Hulk winning by just four votes. He was pretty quiet in the race this weekend, doing nothing to particularly affect any decisions on his character, so the question remains - will he get your vote today? He is called the Hulk, after all.